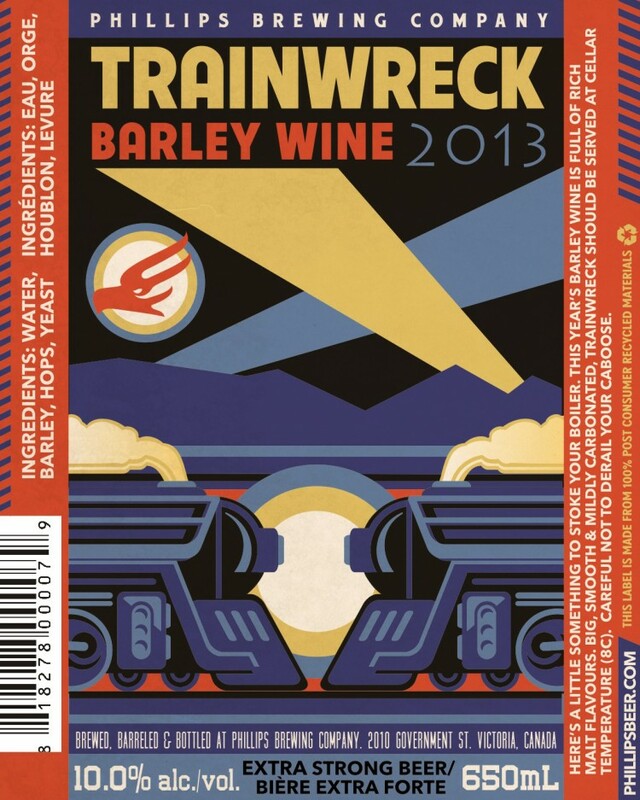 Just in time for the holidays, Phillips is once again back with their annual Trainwreack Barley Wine. This year, much like last, they have decided to release their extra strong ale to a bourbon barrel-aging process in order to produce an ale that is strong (10% alc/vol), yet smooth, and has a strong whiskey tang. This is the second year in a row that they have gone this route, whereas their 2011 was just the barley wine without any whiskey-infusion. As I’ve said before, I preferred the original and feel that Phillips has been on an inexplicable Bourbon kick for the past few years. Nevertheless, they seem committing to making ales that have that extra kick. And the end result is hardly unpleasing or unappetizing, and is pretty much what one would expect from a faithful example of an American Barley Wine that is infused with a bit of Bourbon flavor. It pours out dark and clear, has a good head and carbonation, has some smooth malt the tastes of molasses, dark sugar, dark fruits (dates, plums and raisins), and is of course punctuated by a strong whiskey tang and bite. This entry was posted in BC Beer, Reviews, Seasonal Beer and tagged barley wine, BC beers, bc breweries, bourbon barrel-aged, bourbon whiskey, christmas ale, phillips brewery, phillips trainwreck barley wine 2013, seasonal beers, victoria bc breweries, whiskey, winter ale by storiesbywilliams. Bookmark the permalink. This stuff is better after at least six months to a year. I would imagine. I managed to withhold drinking the Mill St. 2013 version for a few months, but that was a total fluke! I had two of those lol.